Telescope Lakeshore Wicker Arm Chair. Wicker Frame Finish available in Driftwood or Java. When ordering you can choose from the available fabrics. We have the fabric swatch books at our store. Dimensions: 31" wide x 35" high x 30.5" deep with a seat height of 19 inches. 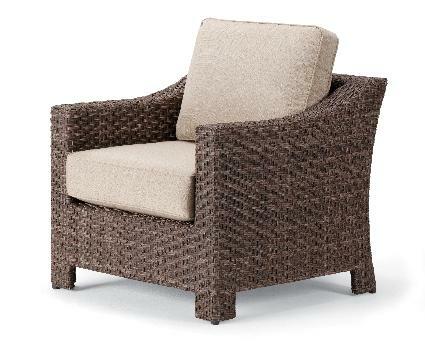 As shown in photo - with Driftwood Wicker and Linen Champagne fabric (a value acrylic fabric).